Overall, access to the Internet is nearly universal in Seattle. That has important implications for making essential city services available over the Internet. It’s particularly good and important news for Seattle’s kids. However, the “digital divide” hasn’t gone away entirely; it’s just become shades of grey instead of a black-and-white question of whether someone does or does not have access. The city should invest more heavily in making low-income households aware of the programs available to let them get internet access at a discounted price. The city should also think about whether to expand programs to offer help to those who need it to access the Internet. Older residents, those with disabilities, and those for whom English is not their primary language still could use a boost. The report lists several tactical next steps for the city, some addressing the above points. Not on its list, however, is further exploring municipal broadband. The report puts such an effort in a different light; no longer is the issue providing internet access in unserved (usually low-income) neighborhoods. The issues would more revolve around cost of the service, and making higher-speed service available. Overall, home internet access penetration is now at 95%, up ten points from 2013. And while in 2013 89% of the city’s residents had mobile phones but only 58% of those could access the internet, now 93% of Seattle residents have an internet-capable mobile phone. The study showed that several demographic groups are now “fully served,” including households with incomes of $50k or more (99%), households with children aged 17 or younger (98%), and households with children who attend who attend Seattle Public Schools (98%). That’s great news, especially for kids living in Seattle. It also found no significant gender gap, across, women, men, and gender-conforming persons. The differences between Council districts were also small, with the lowest being District 2 at 93% and the highest Districts 3,4 and 6 at 97%. Where there are demographic differences, they relate to income, education, disabilities, and to a lesser extent age, spoken language and race — though the for all of the demographic groups called out in the study, the vast majority of people have Internet access. The study says that 88% of Seattle residents have fixed broadband at home (the remainder having free/public access or only cell phone access). Only 57% of residents know the speed of their connection, but of those that do know, the majority have 100 Mbps or faster connections. 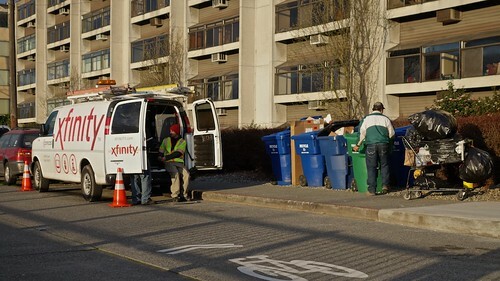 The majority of fixed broadband connections are through Comcast. The study provides data on what people are paying for their internet access, but it’s difficult to draw any conclusions from the numbers since so many people bundle Internet access with other services such as television and phone. For those who pay for Internet access alone, the average monthly cost is $69. The amount that people spend on Internet and other services increases with household income, as one might expect. The devices that people use to access the Internet — and how many a household has — varies by income as one might expect, with fewer computers and tablets in lower-income households, and nearly universal presence of both smartphones and computers in households making at least $50,000. Interestingly, there is almost no variation across Council districts other than use of tablet devices. The study notes that the low-income programs offered by Internet access providers are now well-known or broadly used. Only 23% of low-income households that would qualify for the programs are using them; 53% are unaware of the programs, and 24% are aware but not using them. There are a few surprises in the statistics for online activity — and a few things that are not surprising at all. Online activity increases with household income, and with the presence of children in the household. And households that include individuals with disabilities have lower levels of online activity, as do households with older (age 65+) individuals. But racial/ethnic minority households have higher online activity levels. And households where English is not spoken as a primary language are bipolar: a greater share with high online activity, and a greater share with low activity. Households with racial/ethnic minorities, a primary language other than English, older adults, and individuals with disabilities also have a higher reliance on others to help with access and use of the Internet. That also correlates with lower income households. 23% of residents said that they had some form of barrier that prevented them from using the Internet more. Of those 23%, more than half said that the service was too expensive, while 34% cited issues with the quality or speed of their service. This entry was posted in News, etc. and tagged city hall, technology by CHS. Bookmark the permalink. Lots of charts, but at the end of the day I’m still paying Comcast about $1k a year for something that incrementally costs them almost zero. We need more competition for Internet access. Yes. There are alternative ways to provide superior service that the survey doesn’t begin to address. I had an opportunity to participate but declined for those reasons. It read more like commercial propaganda to me. I’ve been in contact with these alternative providers and learned of the shameful behind-the-scenes cutthroat behavior of Comcast, CenturyLink, et al. in concert with local government. So does it “incrementally” cost almost nothing to serve the whole city? Or does it “incrementally” cost almost nothing just to serve YOU, because everyone else is paying for it? The question should be /cost per customer/, and for Comcast, this is negligible. But, in an uncompetitive market, it can gouge people like Alocal with no repercussions. Do you think the internet is made of air? Not to mention most of the ISPs you are dealing with buy their bandwidth from a provider that’s actually more like a wholesaler – so the company you are buying it from is paying a margin to the one who really runs things. Or perhaps look at other countries where cable companies have been forced to carry other providers and note the lower cost ? When did Comcast employees become volunteers? It does cost more than zero to pay your technicians a living wage so they can go fix the network when som thing goes wrong and your service goes down. So your claim that it incrementally costs them almost zero is flat out false. The only thing I find shocking about the results of this study is that it doesn’t culminate in an outstretched palm, and a plan for another special property tax levy. 5G wireless is going to give Comcast a run for their money and rates will come down for internet access as the technology matures. Not unless they remove data caps for 5G. And Comcast rates won’t go down. They’ll enter or buy their way into the 5G market. Traditional internet won’t go down at all, as you’ll have captive people who can’t or won’t move to 5G internet. If anything it’ll continue to go up. The 5G spectrum is hardly any more competitive than traditional internet access. But if you want to keep rates much more competitive …write the FTC and FCC to oppose the merger of T-Mobile and Sprint. If you want rates to be more competitive, then force cities to sunset their franchise agreements. The internet pipes should be owned by local jurisdictions or a private, non-ISP company. They then lease space to a competitive bunch of ISPs. Franchise agreements were meant to have private companies come in and build out communication networks for cities that wouldn’t have the means to do so themselves. In exchange, the private companies would get a regulated monopoly for a set amount of time to recoup the costs. Ideally, the ownership of the networks could then revert to the local municipalities. Unfortunately, nobody really considered the endgame of these franchise agreements and now we are stuck with perpetually uncompetitive communication companies holding us hostage. As a result, the US is among the highest internet costs of the developed world. Was DSL Service counted as high speed? The discount programs the companies offer are not available to everyone who is low income. Comcast doesn’t offer their internet essentials to those who qualify for food stamps or Medicaid, as many other programs of this nature do. So if your single and working poor your not able to sign up for their $9.95 a month 15 mbps plan.